Because of their biological biodegradability, the use of bioplastics is especially popular in the packaging sector. By far the most distributed form of bioplatics in this sector are packaging chips that are being produced from a thermoplastic starch base and which are often soluble in water. Aside from this, however, several other packaging products – manly used in the food and cosmetics industries – can be made from compostable bioplastics. Technically there are several methods by which bioplastic intermediates can be processed into various products. As is the case with conventional plastics, they can be blown to foils and multi-layer foils, they can be extruded, they are thermo-formable and deep-drawable, they can be printed, welded, thermally sprayed or glued together. 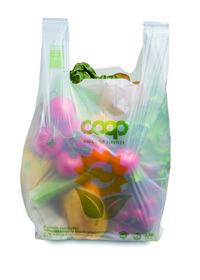 The use of bioplastics for shopping bags is already very common. After their initial use they can be reused as bags for organic waste and then be composted. Trays and containers for fruit, vegetables, eggs and meat, bottles for soft drinks and dairy products and blister foils for fruit and vegetables are also already widely manufactured from bioplastics. With cosmetic products, bioplastics are used not only as the outer packaging but also for the tubes and pots in which the cosmetics themselves are contained. Certain characteristics of bioplastics – such as their aroma barrier and the ease with which they can be moulded – make them particularly suitable for use with cosmetics and are continually being developed in order to make bioplastics an even more attractive alternative for such packaging. Composite packaging made out of paper or cardboard with a bioplastic coating forms a whole new category of compostable packaging and allows waste processing and recycling without the need for complicated and costly waste separation methods. In the area of waste management, compostable bags and containers for the collection of organic waste already possess a considerable share of the market, whereas in relation to most other types of packaging – such as for food and cosmetics – the use of bioplastics remains secondary. Yet it is precisely in these areas that a significant potential exists for the use of bioplastics, due to their beneficial physical properties and lower costs of disposal (approximately 1 Euro/kg less than conventional plastics).